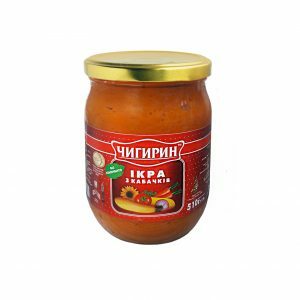 Ingredients: zucchini, tomato paste, refined sunflower oil, onion, carrot, salt, flour, dill, parsley, black pepper, fragrant pepper. Nutritional (nutritional) value of 100 g of product: proteins – 1.0 g; fats – 7,0 g; carbohydrates – 7,0 g.
Vitamins, mg: ß-carotene – 0,92; В1 – 0,02; B2 – 0.05; PP – 0.36; C is 7.0. The energy value (caloric content) of 100 g of the product is 97 kcal. Shelf life 3 years when stored at temperatures from 0 to 25 ° C and relative humidity not more than 75%.